The video shows the train — which was roughly 662 feet long — passes the camera in just over five seconds. But AP found that the surveillance video plays back slightly slower than in real time. So, adjusting for the slower playback puts the train’s estimated speed at 107 miles per hour. The surveillance camera was located at a site just before the bend in the tracks. The crash killed seven people and injured more than 200. Updated 1:55 p.m.: Philadelphia police officials say the engineer of the Amtrak train that crashed, killing seven people and injuring more than 200, declined to provide a statement to investigators. They say the engineer also had an attorney when he left a meeting with investigators. The engineer has not yet been identified. Investigators are trying to determine why the train slipped off the tracks while rounding a sharp curve Tuesday night northeast of Philadelphia’s city center. Authorities say the locomotive’s data recorder has been recovered and that it should yield critical information, including the speed of the train. The speed limit just before the curve was 70 mph and on the curve it was 50 mph. City officials are holding another briefing Wednesday afternoon. The National Transportation Safety Board also plans a 5 p.m. briefing. Updated 1:45 p.m.: A 20-year-old U.S. Naval Academy midshipman from New York City is one of the seven people killed in Tuesday’s Amtrak train derailment in Philadelphia. Navy Secretary Ray Mabus identified the midshipman as Justin Zemser. The popular student leader and athlete was on leave from the Annapolis, Maryland, institution and heading home to Rockaway Beach, New York. Zemser and his family were temporarily forced from the community by Superstorm Sandy in 2012. He was elected student government president at Channel View High School and was a two-time letter winner on the school’s football team. He played sprint football, a form of the sport for players under 172 pounds, at the Naval Academy. 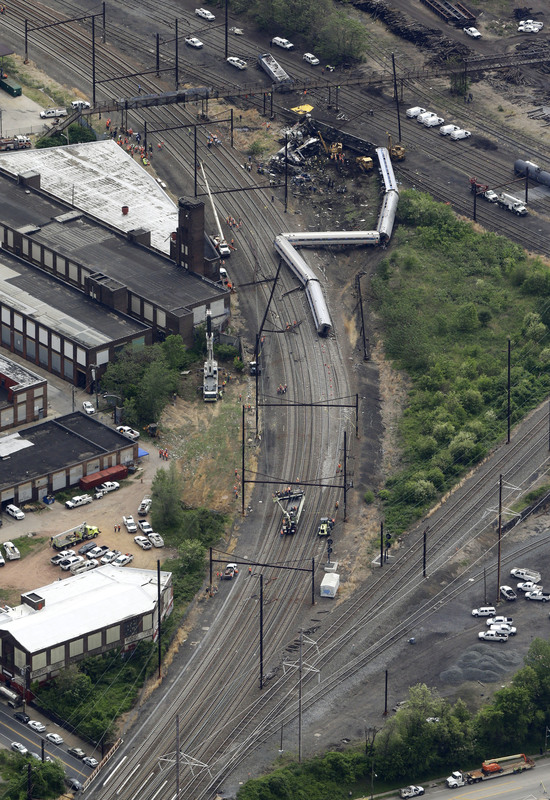 Updated 1:20 p.m.: The Federal Railroad Administration says Amtrak inspected tracks in Philadelphia just hours before a deadly derailment and found no defects. The agency says the speed limit on the track just before the accident site is 70 mph, and 50 mph for the curve near where the train came to a rest. 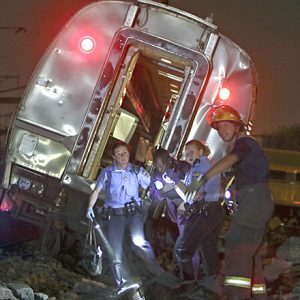 The New York-bound train derailed in Philadelphia on Tuesday night, killing at least seven people and injuring 200 others. Federal authorities will look at a variety of evidence as they try to pinpoint the cause. 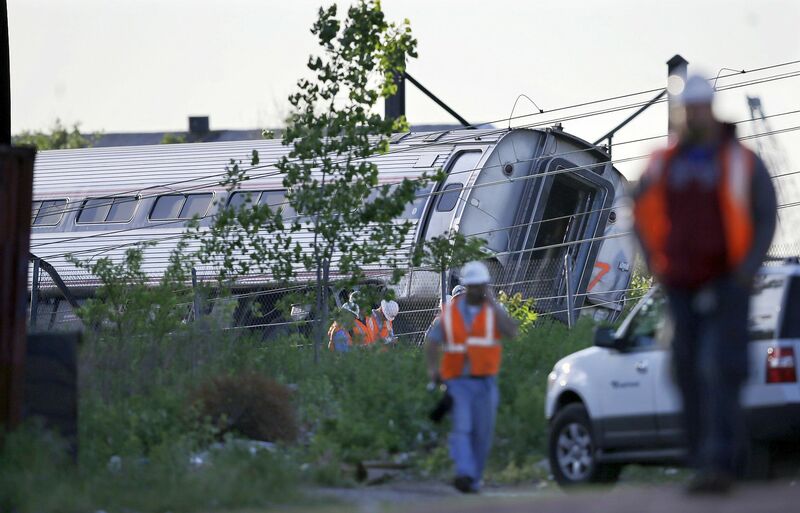 A former head of railroad accident investigations at the National Transportation Safety Board, Bob Chipkevich, says they’ll focus on the train’s event data recorder, video recordings and the condition of the rails, rail ties and train cars. 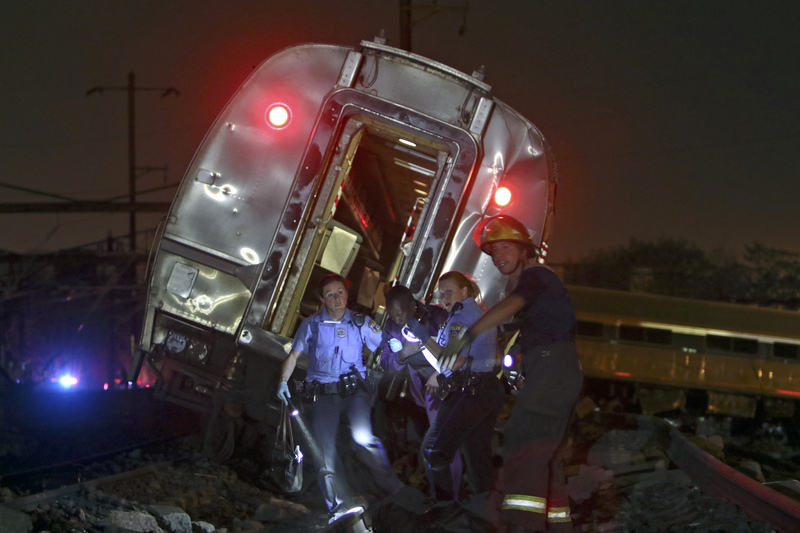 UPDATED: 1:13 P.M.: Another body has been pulled from the wreckage of an Amtrak train derailment in Philadelphia, increasing the death toll to seven. Philadelphia Fire Department Executive Chief Clifford Gilliam says the body was found Wednesday as crews combed through the mangled train. Authorities previously confirmed the deaths of six people. They include an Associated Press employee and a U.S. Naval Academy midshipman. Rescue crews are searching the mangled wreckage as investigators try to determine why the train hurtled off the tracks. The train was carrying 238 passengers and five crew members as it headed from Washington to New York City along the nation’s busiest rail corridor. 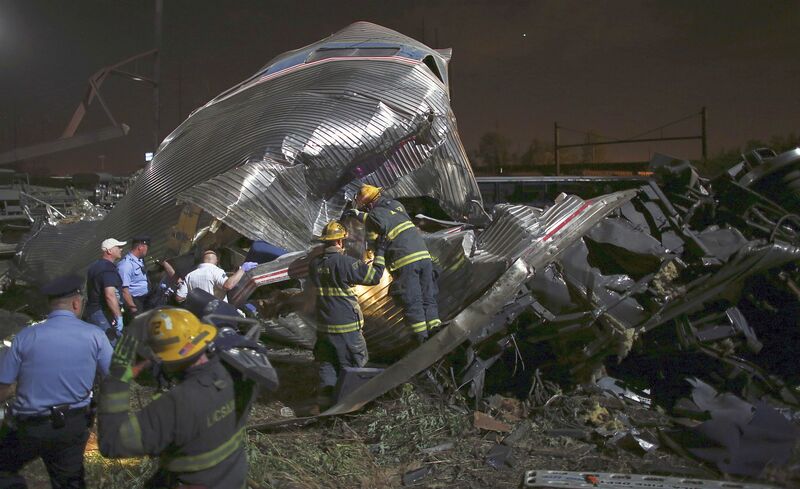 PHILADELPHIA — Rescue crews searched the mangled wreckage for victims Wednesday as investigators tried to determine why an Amtrak train jumped the tracks in a crash that killed at least six people, injured more than 200 and plunged screaming passengers into darkness and chaos. Investigators recovered the train’s data recorders and said they expected them to yield crucial information, including how fast the train was going as it rounded a sharp curve and derailed in the city’s working-class Port Richmond section shortly after 9 p.m. Tuesday. “It’s a devastating scene. There are many first responders out there. They are working. They are examining the equipment, seeing if there are any more people in the rail cars,” Robert Sumwalt of the National Transportation Safety Board said. Mayor Michael Nutter said some people remained unaccounted for, raising fears the death toll could rise, though he cautioned that some passengers listed on the Amtrak manifest might not have boarded the train, while others might not have checked in with authorities. “We are heartbroken by what has happened here,” he said. 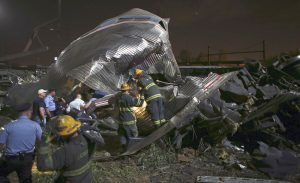 Train 188, a Northeast Regional, was en route from Washington to New York when it lurched to the right and fell off the tracks at a notorious curve not far from the scene of one of the nation’s deadliest train wrecks more than 70 years ago. Passengers scrambled through the windows of toppled cars to escape. One of the seven cars was severely mangled. Hospitals treated more than 200 people for injuries that included burns and broken bones. The accident closed the nation’s busiest rail corridor between New York and Washington as federal investigators arrived to begin examining the twisted wreckage, the tracks and the signals. The area where the wreck happened is known as Frankford Junction. It is not far from the site of the 1943 derailment of the Congressional Limited, from Washington to New York, which killed 79 people.